I'll start a new thread here. 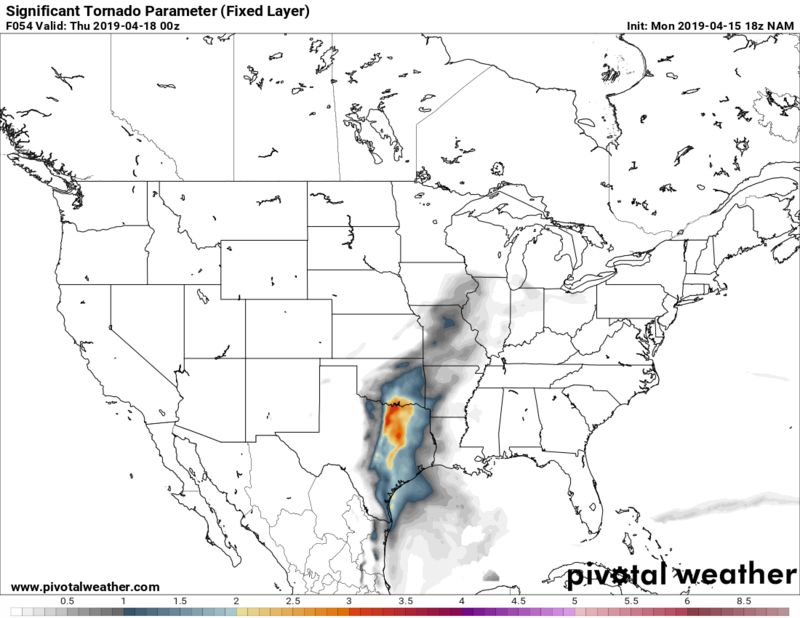 It appears things are ramping up for more potential severe weather on Wednesday. Check out the SPC outlook as of Monday midday. 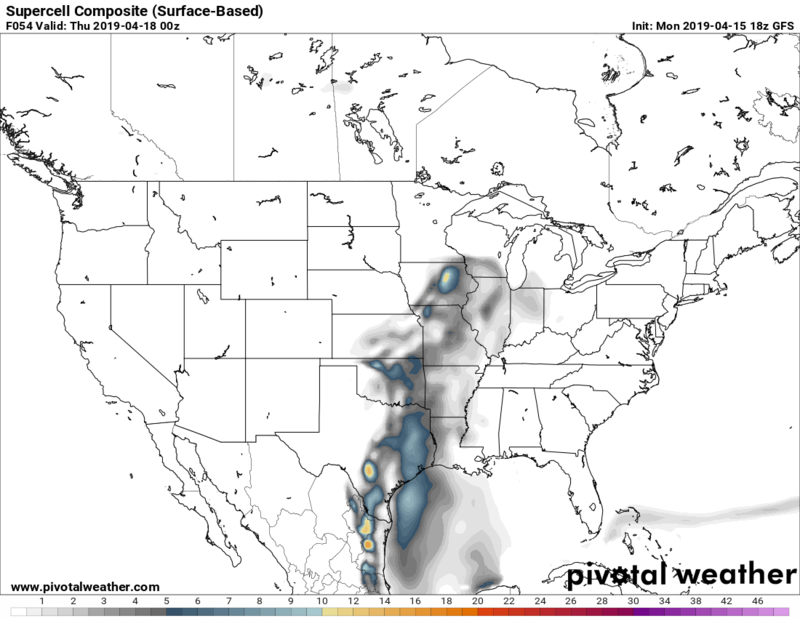 And the NAM SIGTOR as of 18Z Monday Run for 0 Z (7 pm Central) Wednesday Evening. Interestingly enough GFS is not nearly as aggressive as NAM or the SPC forecast. Does anyone have any thoughts on Wednesday yet? A bit early in the game. I guess we'll know more tomorrow. Strong trough punctuated by a <998 mb triple point low looks to set up around Quanah, TX with cold front progressing SE across NW Oklahoma. 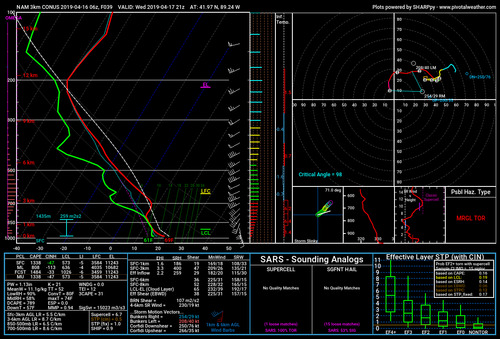 NAM is off the hook regarding lift in the region looking at the 1-10 p.m. timeframe as runs show cap beginning to weaken at 1 p.m. VBV profiles dampen the tornado potential showing veering at 700 mb which is a bit of a bummer not to mention that upper level winds are out of the SW and aren't backed out of the west given the trough and the polar jet swinging around the upper level cyclone. See some of the dreaded S-shaped hodographs particularly OKC and points west and east along I-40 but improve the further south you go. This looks at minimum like a substantial hail event. STP's really ramp up as you get to Ardmore and progress south on I-35 from 4-10 p.m. Probably and most alarmingly, CIN does not build in from 7 to 10 p.m. which typically kills noctornal events but the triple point low and tapping the cold air will keep the cap at bay I would imagine. Worse, it shows the dryline temporarily sags back during this time frame. Yikes. Monitoring vertical wind profile readings from radar sites in the affected area will obviously be key during day of event. But if I am living from Denton to Austin, TX and points eastward, I am chewing my nails on this day. Given the timing / amplification issues that the models are finally starting to get a handle on, I do think there is still the potential for a few tornado reports in the vicinity of the dryline bulge. That area seems to hold the most optimal moisture quality, given more paltry, shallow profiles further north. 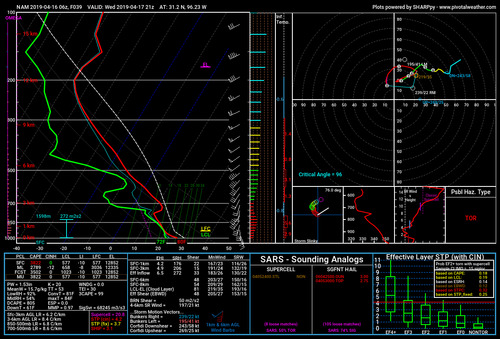 However, some of the 0 to 1 km profiles are favorable later in the day as CIN weakens and the window for convection becomes more favorably juxtaposed with the best low-level shear profiles for tornadic supercells in a classically favorable area (as noted by another poster, I do see the VBV profiles showing up on some of the NAM soundings between H85 and H7). 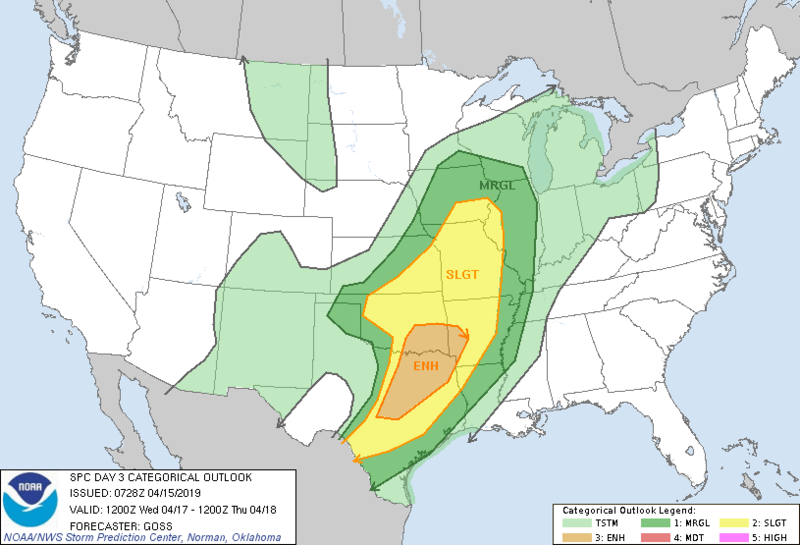 Further to the north, particularly across at least the northern third of Oklahoma and perhaps into far southern Kansas, as well as up north in Iowa near the surface cyclone INVO the northern stream perturbation, the threats appear more likely to be large hail and maybe some SVR threshold wind damage reports. 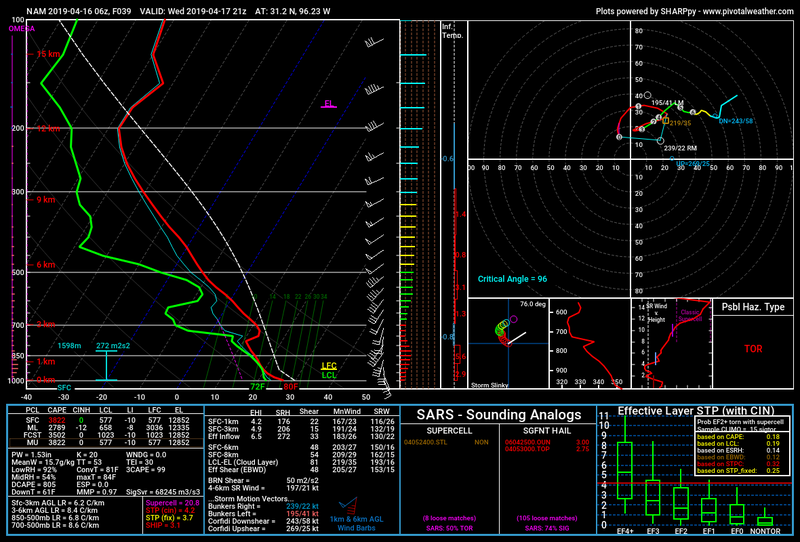 Forecast wind profile for the TX/OK target is one of the weirdest I've ever seen. If you just looked at the 850-500mb crossover you'd think everything was hunky-dory. Meanwhile the 3K NAM portrays a rather enticing wind profile over northern Illinois, although it doesn't break out any convection there before dark. However, history has shown that's an area worth keeping an eye on, especially when conventional parameter-based forecasting puts the "meat" of the threat over Iowa. That initial shortwave and angle of the main trough really does a number on the 0-3 km shear. The turning is there in the lowest 1 km for low-level mesocyclones but that weakness and slight backing around 700 mb creates that unfavorable deviant storm motion vector crossing the hodograph. With the massive MLCAPE values (for this time of year) and the noticeably deep moisture with surface dewpoints in the upper 60s, I don't doubt we'll see a few discrete supercells that drop some gorilla hail around DFW. The tornado threat could ramp up after dark as Jesse noted as it doesn't look like the boundary layer is going to decouple/hodographs could theoretically only improve with the dryline stalling to only slightly retreating into the overnight hours. I quite fancy western Oklahoma - on the nose of the mid-level speed max/dry punch. There may be a fairly short window but a few supercells are possible there, I would suggest. Reasonable veering profiles - although a bit of a question mark around low-level shear in that area. The Arklatex region could perhaps be a decent place to catch a couple LP supercells, but the tornado threat would likely be low in that region and any threat would likely be occurring in a short timeframe. Could be a good day for some lightning action though. Just looking at central/southern Oklahoma, based on the HRRR progs, I doubt there will be any sustained convective development during the daylight hours. There may be a slight possibility of convection farther south toward the Red River, but even there, I'm not sure there will be any robust convection prior to 01-02z. As a point of reference, 00z HRRR 24 hour forecast sounding at Oklahoma City at 00z Thursday shows large T/Td spreads and relatively weak winds from the surface up to 3km. Convection seems much more probable near the DFW metro area and closer to the surface low from the Texas panhandle into northwestern Oklahoma. From both a chasing and public perspective, I'm not overly interested in or concerned about storms anywhere near Oklahoma City Wednesday afternoon/early evening. Looking at the CAMs, they don't want to break out any storms in SW Okla. 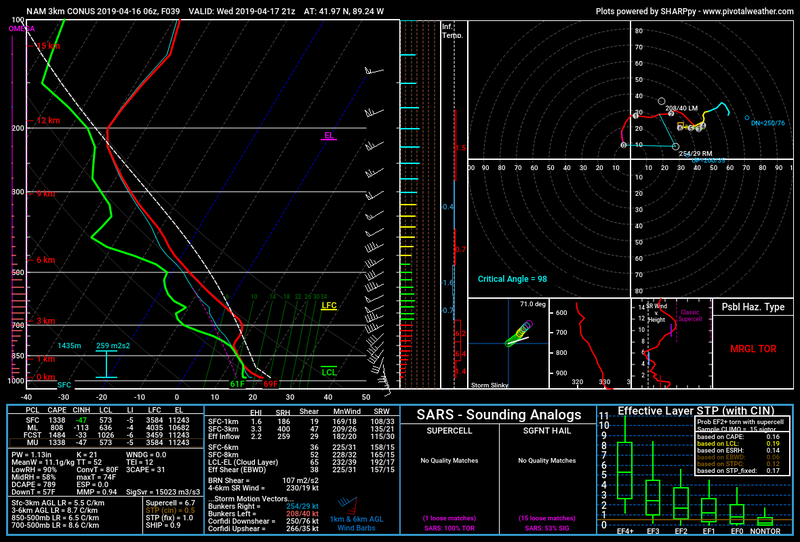 When I look at soundings around 00z for CHK, OKC, and OUN, the atmosphere looks fairly uncapped. I don't see much eastward progress on the dryline so perhaps they aren't forming storms because there isn't a good boundary to kick them off. Just some thoughts on why models are forecasting storms for SW Okla. Any ideas guys? Also, by tomorrow we will know what solution was correct. To any of those actually chasing good luck. So much chaos in this forecast.